30-year-old society matron Lola Woodby has survived her loveless marriage with an unholy mixture of highballs, detective novels, and chocolate layer cake, until, her husband dies suddenly, leaving her his fortune.or so Lola thought. As it turns out, all she inherits from Alfie is a big pile of debt. Pretty soon, Lola and her stalwart Swedish cook, Berta, are reduced to hiding out in the secret love nest Alfie kept in New York City. 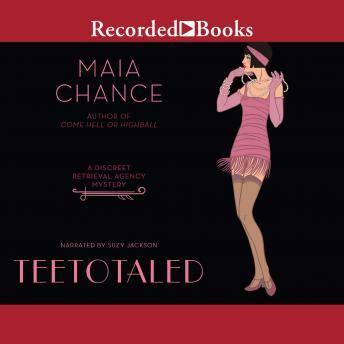 Charming, witty, often laugh-out-loud funny, Maia Chance's Discreet Retrieval Agency series introduces a sparkling new voice in crime fiction. MAIA CHANCE was a finalist for the 2004 Romance Writers of America Golden Heart Award and is a Ph.D. candidate at the University of Washington. She is writing her dissertation on nineteenth-century American literature.